Blaine Suarez, also known as blicka, is a Georgia born Producer creating explorative bass driven music. In 2010, Blicka began engineering his unique style of melody heavy electronic music with dark, reggae and even jazzy influences, quickly creating his own aesthetic in sensual and emotionally empowered rhythms. Self expression and unity through sound and mind alike as the main goal, Blicka was quickly recruited by Miami music crew Basshead Music in 2012 where he relocated and began making a name for himself with bass heavy dub step music. upon the disbanding of Basshead music, He once again began exploring mediums for bass music in south florida. 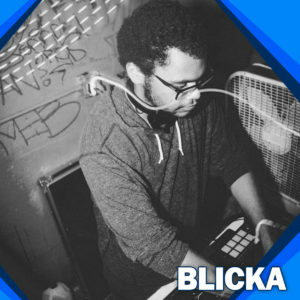 With the intentions of keeping the spirit of Dubstep alive in the southern regions of the US, Blicka joined LOWR LEVLS. Blicka has shared memories and stages with the likes of Hatcha, Skream, Mala, 12th Planet, Jakes, Silkie and many more during the fortification of the south florida music scene between 2013 and 2015. fast forward to present day, Blicka has a growing respect for the roots of dub step music, making authentic and organic dubs with deep dark and even reggae influences. Florida native Drews Theory made a name and an image for deep, organic and authentic bass music in early 2015 and Blicka was among the first recruits to fortify the vinyl based Label/ crew “Version Collective”. now notoriously known as truly avant garde in every aspect , each song he makes, no matter the genre, is guaranteed to pull emotions of all kinds out of the soul and create a language of sound and form of interpersonal communication. if soul-searching is your prerogative, Blickas music and Live Dj sets are an absolute must.